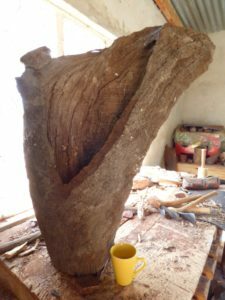 While my first love is Mopane, sometimes a piece of wood from another tree offers itself irresistibly to the sculpting process. 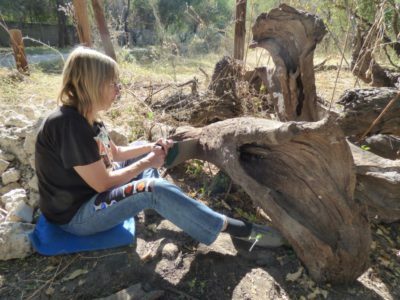 Last month, Maun friends Desiree and Pierre Sharp pointed out the remains of of an old Combretum imberbe outside their gate. 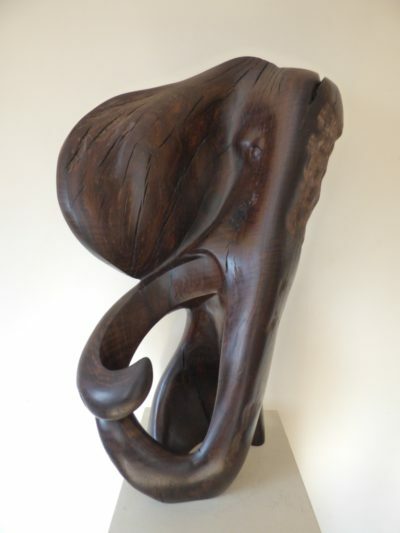 Known in English as Leadwood, and in Setwana as Motswiri, the wood from this tree is heavy enough to sink in water, and its coarse and wavy grain is a challenge to the carver. One long trunk piece with an extraordinary broad wing called to me. 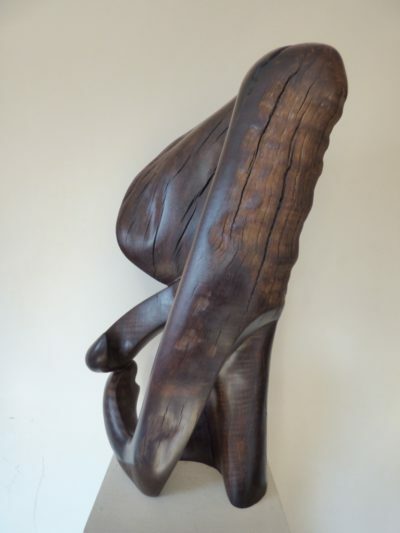 Knowing where to cut a piece from its larger body depends a lot on my original impression: the story I see in the wood. In this case, the broad “wing”, with its dark and furrowed surface, spoke of a common experience in the African bush. Sometimes what seems to be a grey termite mound in the hazy afternoon heat can move, and become a living elephant, its huge ears slowly fanning, as it wraps its trunk around a particularly delicious piece of tree bark. 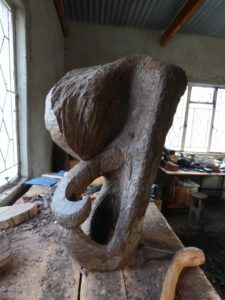 At the beginning of the carving process. 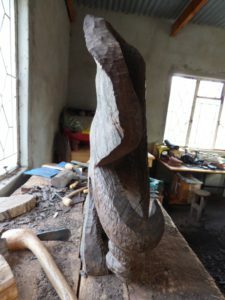 The process of cutting and carving. A step closer to the finish. lustre. The natural fissures and furrows provide areas of contrast. Flowers of the Combretum imberbe tree, captured by PlantsandpeopleAfrica.